HomeAll articlesVision & IdentificationClear Strategy or Plain Guessing? Clear Strategy or Plain Guessing? Sensor Instruments GmbH: In the last years the spray nozzles at windscreens have seen quite some development. The jet now comes as a fan jet or spot jet. A homogeneous spray mist application onto the intended angle range is now accurately guaranteed with fan jets, as is the point-shaped jet application on the front cameras by means of exactly directed and hardly diverging spot jets. The individual mechanical adjustment of the inclination of the fan jet and spot jet makes it possible to use the spray nozzles for various vehicle types. Of course such adjustment today in most cases is performed automatically, which apart from a sophisticated handing system above all is made possible by corresponding sensors. 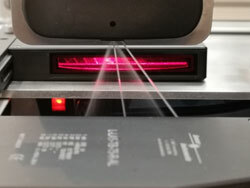 So-called laser transmitted-light line sensors are used for checking the respective angle positions. Especially due to the relatively large angle of the fan jet in one plane it is appropriate here to use a large scan range (L-LAS-TB-100-T/R-AL-SC), which furthermore allows the simultaneous detection of the spot jet. It must be ensured, however, that the two planes are checked simultaneously, which means that a second laser sensor with a smaller detection range that is arranged vertically to the first one is required (L-LAS-TB-50-T/R-AL-SC). With a special L-LAS-Spray-Control-ScopeV1.0 software that was specifically developed for the spray process the positions of the respective spot jets and of the fan jet are determined in both planes. From the distance data the downstream PLC then determines the opening angle of the fan jet, the angle position of the fan jet, and the emission angles of the spot jets in both planes. Based on these data the spray jets can then be optimally adjusted.